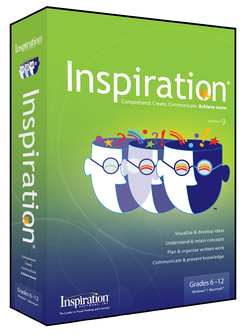 For visual mapping, outlining, writing and making presentations, use Inspiration 9.2, the ultimate thinking and learning tool. Brainstorm ideas, structure your thoughts and visually communicate concepts to strengthen understanding with the Diagram and Map Views. To take notes, organize information, and structure writing for plans, papers and reports, use the integrated Outline View to focus on main and supporting ideas and to clarify thinking in written form. With Inspiration's Presentation Manager, transform your diagrams, mind maps and outlines into polished presentations that communicate ideas clearly and demonstrate understanding and knowledge. Improve communication and share what you’ve learned with Inspiration’s Presentation Manager. Use the content you’ve developed in Diagram, Map and Outline Views and expand your work into more thoughtful and compelling presentations and final projects. Inspiration provides all the tools to create organized, polished, formal presentations that convey ideas clearly and demonstrate your understanding and knowledge. Use the FREE Inspiration Presenter to show your presentation easily on any Macintosh or Windows computer. Use the Site Skeleton export to transform diagrams into HTML web sites. On-demand Training Videos show you how to use Inspiration's most commonly used tools.